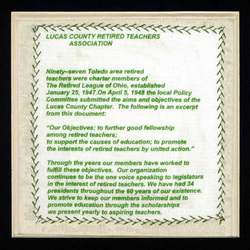 The names of 97 Toledo Ohio area retired teachers were listed on the roster as charter members of the Retired Teachers League of Ohio, Lucas County Chapter. Established January 25, 1947, the organization mailed a letter dated March 6 of that year to Ohio retired teachers, encouraging membership and recommending that a county chapter be organized. The constitution and bylaws of the Lucas County Chapter of the Ohio Retired Teachers Association were adopted October 27, 1955. Amendments and revisions have been made through the years. Membership in Lucas County RTA has grown steadily. The membership has long been active writing to legislators to express support for bills that would benefit retired teachers.